Michael Gray founded Uncommon Adventures in 1984 a couple of years after getting a degree in Environmental Interpretation at MSU. With nearly 30 years in the business, Michael is one of the most experienced instructors and guides in the country. He’s led trips all over the world including Alaska, New Zealand, Greenland, Iceland and Central America. 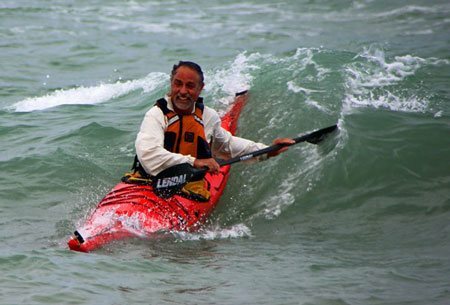 He is an ACA Level 3 Coastal Kayak Instructor Trainer and a Level 4 instructor. He also holds certifications in Canoe and SUP instruction. Of particular note is Michael’s reputation as a phenomenal backcountry cook. Our guests often say they don’t eat as well at home as they do on Uncommon Adventures trips. Michael’s cooking presentations/demonstrations are among the most popular sessions at the country’s leading kayak symposiums, and his articles appear in major kayak publications, websites, and his cookbook! Having taught outdoor skills and environmental workshops all of his adult life, Michael interprets wild places with warmth and respect.